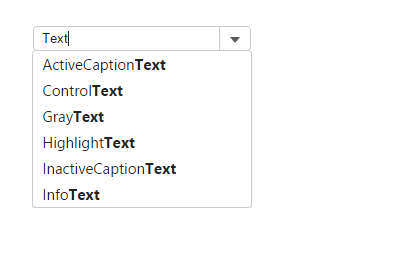 AutoComplete shows suggested text for a field in a drop-down list by retrieving data from the server. This list is filtered as the user types, making large lists easy to work with. You can populate AutoComplete with data from arrays or dynamic lists. AutoComplete can show string values from a list or display values through complex binding by mapping the DisplayMemberPath and SelectedValuePath to object properties. AutoComplete offers several properties for altering its behavior, like the CSSMatch property. With the CSSMatch property, you can specify the CSS class that is used to highlight the parts of the content that match your search terms.